The builders at JDC Building Services have been building, renovating and extending for more than 25 years all over Melbourne. In addition to custom builds, they are also specialists in sloping blocks which are a common sight around Melbourne. For the new website we created a clean, modern and easy to use design. Our content writers prepared a range of new content that aligns accurately with the business message and reflects the services on offer. 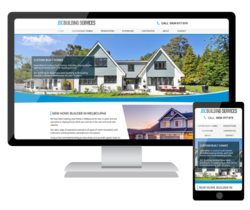 Be sure to check out the website, and if you are in Melbourne looking for a quality custom builder, give Jason and the team a call.